Landscape and art share a similar aesthetic, especially in the West where we live with the daily majesties of nature, carved by time, smoothed by weather. There is also a tradition of speaking about the land through art. 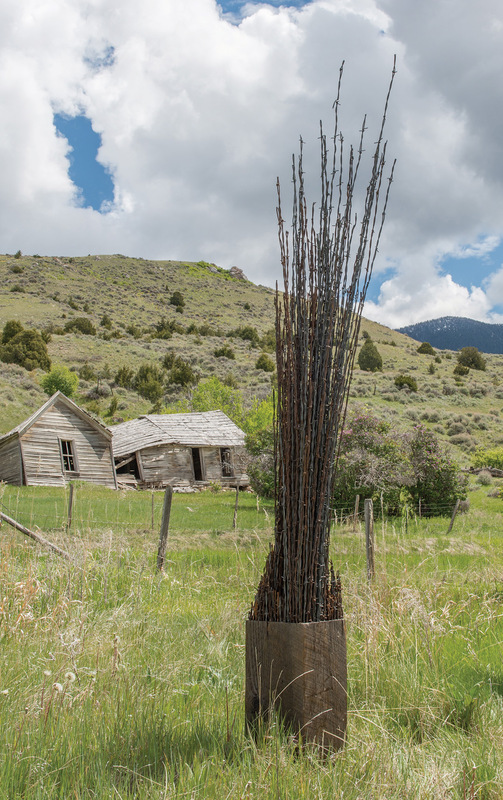 In southwestern Montana, three artists are engaging with the land, each bringing a different perspective: conjecture, introspection, and reclamation. For the last 10 years, Salix has expressed the tragic beauty of open-pit gold mines, portraying carved out mountains by using gold leaf within the portrait of the mine site. He’s used diesel oil to paint refineries. 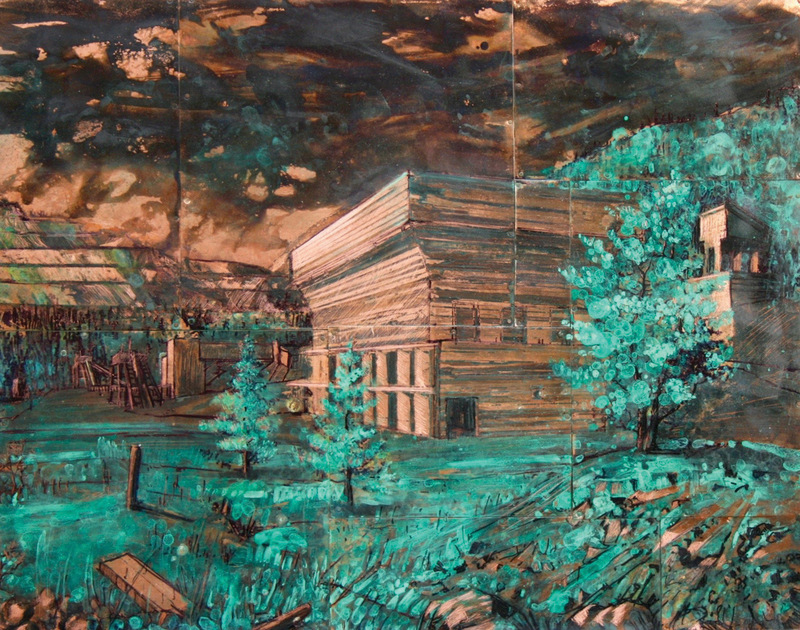 And more recently, he’s played with the properties of copper plating as his canvas in order to relate the destructive nature of copper mining in British Columbia. 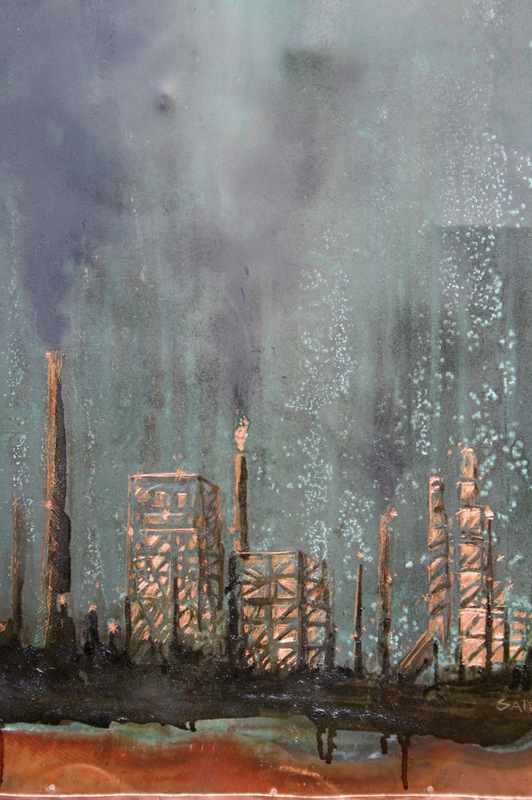 In a piece called Carbon Aurora Salix creates a smokestack version of the northern lights on recycled copper plating. His colors, created from patinas, balance on the edge of the sublime — poignant and stunning. 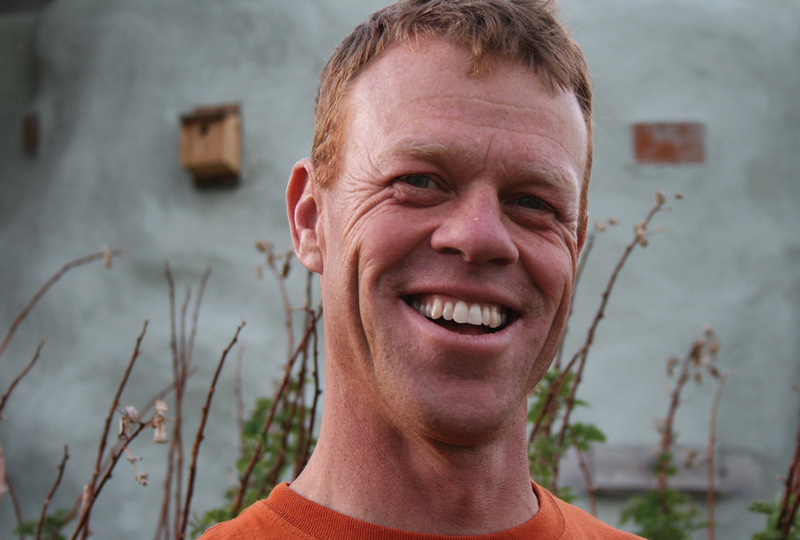 His work reminds us of the permanence of destruction, how impossible it is to glue a mountain back together. Most recently, moving away from art as an object-based commodity, Salix is experimenting with large installation work. He’s inspired by land artists from the 1970s, like Robert Smithson with his Spiral Jetty and Nancy Holt’s Sun Tunnels. Set up in the outdoor portion of his studio, a long, partially-built sculpture lies on the ground. When upright, Nyx, named for the goddess of night, will stand 15 feet tall and be a habitat for bats. The sculpture, the head of the goddess with her mouth open to accept the bats, will be painted in bronze patina. Another project Salix is working on speaks to the problem of relocating beavers. He wants to build a “suburban home” near a riparian area where he hopes the beavers will add to the piece by mounding a lodge on top of the “house.” The house, although identical to a typical suburban home, will be beaver-sized. 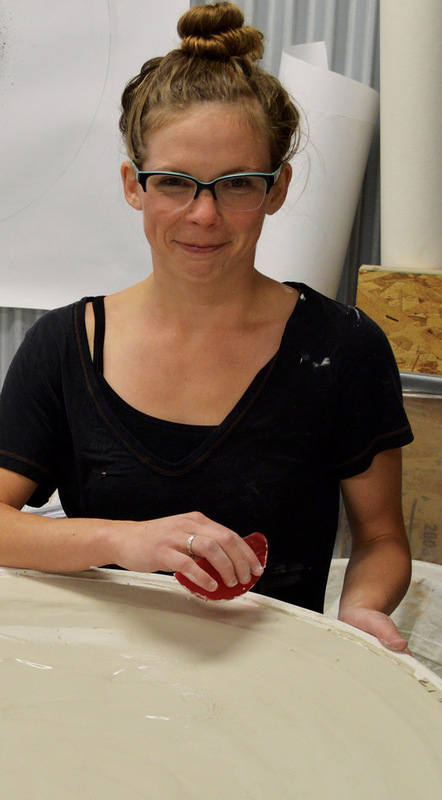 Ceramic artist Rachael Marne Jones’ latest piece portrays a personal experience she had with the land. Starting with a word map, she scours dictionaries of ancient terms for precise descriptors of place. 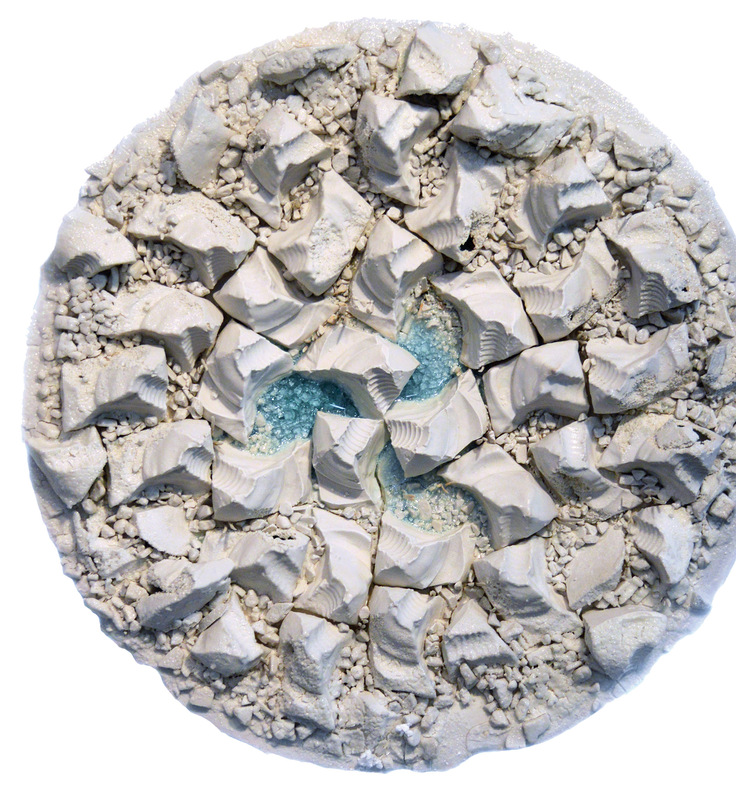 The piece in process is a disc with slip-cast replicas of a found glass transformer, interspersed with kiln-melted glass and thin blades of cast porcelain. The words accompanying the sculpture, “friable, febrile earth, mum, crizzle, recondited, ungine,” also act as the title. Getting through to that experience, embedded in her subconscious, is part of Jones’ process, digging it out with the tools of language, which in turn translates into art. The finished piece, round and platter-like, will serve as an emotional metaphor for the landscape that Jones experienced firsthand. The jagged edges of broken glass, slip-cast in clay, glazed, and placed deliberately, bring her back to the moment when she stepped across the fissures of ice. Smoothed and melted glass, the color of sky reflected in water, situates the narrative in the landscape. Interspersed within the piece, bone-like fins protrude from the lens. “It’s an examination of insulation,” she says. 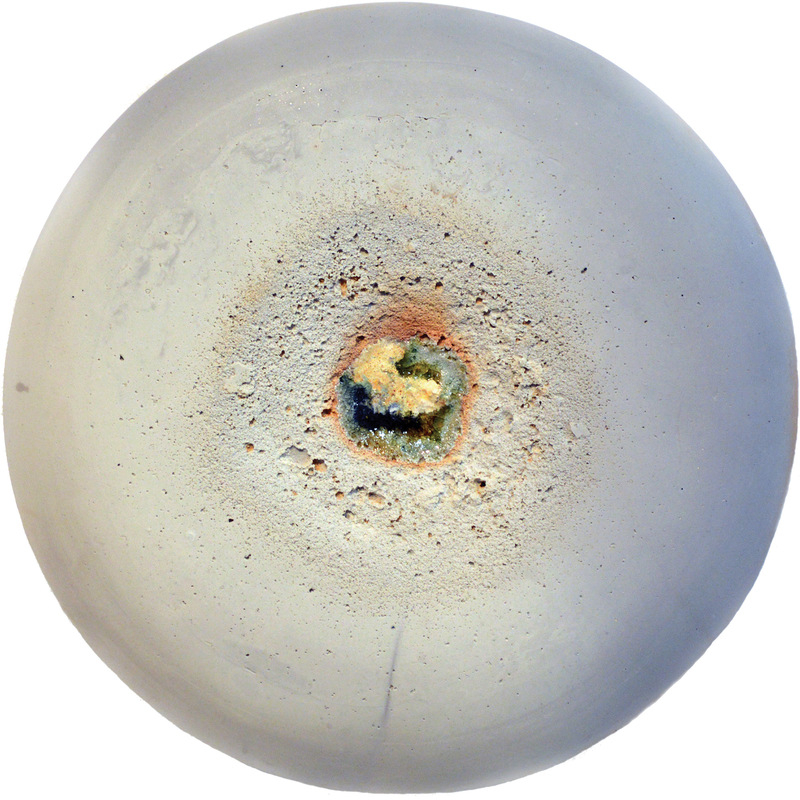 “Of the qualities of glass, the qualities of porcelain and the qualities of ice.” It is also a comment on the ways we insulate ourselves from the landscape. 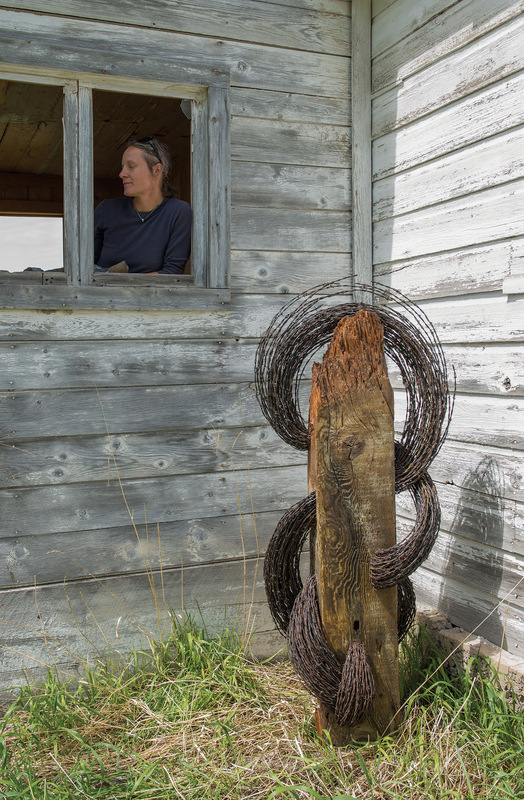 Jennifer Pulchinski’s barbed wire sculptures speak to the land in yet a different way. She’s reclaiming the very same material used to conquer the West. Without barbed wire, farmers and ranchers could not have so readily domesticated the land. Pulchinski roams to out-of-the-way places and finds rusted, twisted, and discarded barbed wire. She unkinks, rebends, and tames it to create line and curves, intricate knots, and straightened pillars that stand against the horizon. In her studio, coils of rusty wire rest one on top of another. Wrapped around a found tree stump, battered from the river, a new sculpture is in process. With duct-taped welding gloves and wire cutters, Pulchinski painstakingly works the steel until what was once bounded along fence lines or buried beneath the soil can be braided into her design. There is an elegance and grace to her work that is somehow transformative, embodying an organic form made from the inorganic array of barbed wire. It starts with what was thrown away — the notion of taking down fences — and changes it into a meaningful statement about the West. 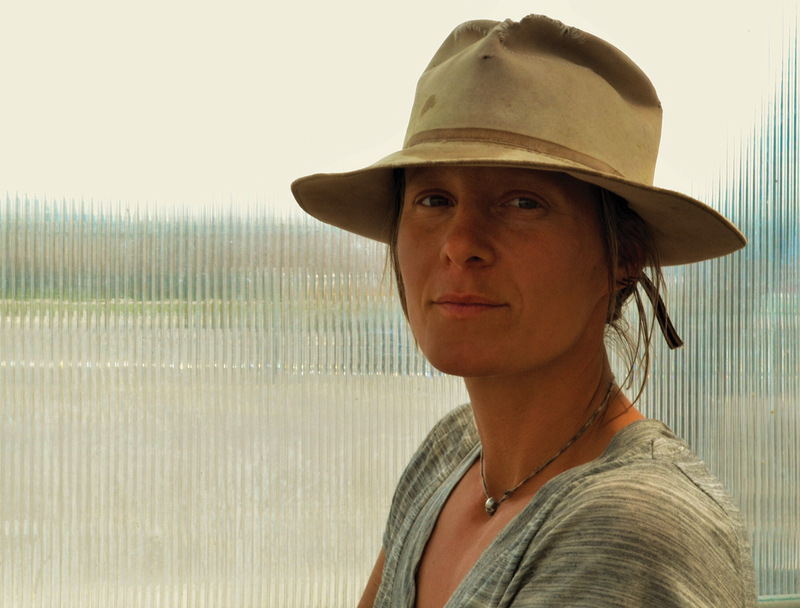 Artists who speak about the land and landscape of our lives act as translators for us. But what is our role as viewers? Like Salix, we look for the next step in our own evolution; like Jones, we all have the need to internalize our experiences; and like Pulchinski, we take comfort in bringing order to chaos. The effects of place, of our place, run like a coronary artery through our lives, and it is through art that this landscape can be expressed.